Find all the Ultimaker nylon spools produced by the brand. Ultimaker Nylon is available in many colours. Ultimaker nylon filament is suited to all the brand's machines and this Ultimaker nylon filament requires no adjustment within the Cura software. Ultimaker nylon filament is distinguished by high strength and exceptional resistance when printing. Ultimaker nylon thread allows printing of complex pieces without any particular difficulties. 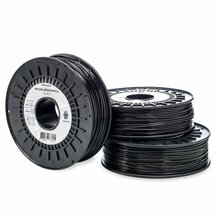 To purchase Ultimaker nylon, please call our consultants before buying.